This is a highly collectible meteorite. It is a very large individual specimen of NWA ???? from Northwest Africa. This NWA meteorite was found in the Sahara Desert. This specimen is a large individual and is fully intact, with the outer crust still very well displayed. 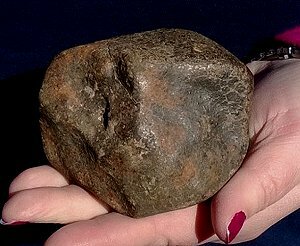 The meteorite is probably a chondrite, but has never been tested, and is possibly a huge MOON meteorite, classified as an anomalous Orthopyroxene- bearing Nakhlite. Ankertitie and other carbonates have been identified in this meteorite, which are preterrestrial in origin (similar to samples collected from the Apollo lunar highland sites). We are not full experts on meteorites, but we do know that this is a special find, possibly being a screamin' rare MOON meteorite!